Tomorrow, Cedar Falls High School will be holding its annual Veteran’s Day assembly to recognize veterans that have served or are serving for the United States. Teacher Kevin Stewart, who organizes the event, understands the importance of this day because he is one of those veterans. He served in the Marines from 1983 to 1987. Stewart first went to boot camp in San Diego. 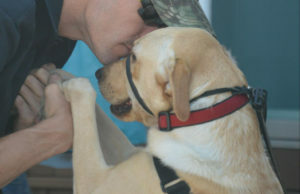 From there he was shipped to Marine Barracks NAS Brunswick, Maine, as part of the security force on a naval base. He moved to Camp Le Jenue, N.C., and served in the 3/8 Marines. Stewart also went overseas to serve in West PAC; he was stationed in Japan and the Philippines. Stewart had many reasons for joining the Marines. “[The main reason was] to serve my country,” Stewart said. Family also played an important role in Stewart’s decision. He has relatives serving for the United States going all the way to back to the Civil War. Stewart’s son will also be serving for the United States. He is currently in his fourth week of boot camp. Stewart describes boot camp as a unique experience. “It’s different,” he said. 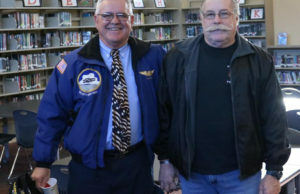 The transition between life in the Marines and life back in the United States as a citizen wasn’t too bad for Stewart, because he was serving during the time of the Cold War. Different people have different experiences. “Some people come back and are fine initially, and then it gets to them later. Everyone has a different breaking point,” Stewart said. T he experience of serving in the Marines has taught Stewart a lot. Above all though, he said it has taught him to lead. “Look all around you,” Stewart said, gesturing to his classroom full of posters and inspirational quotes. “They’re all about leadership traits, and to lead by example,” he explained. 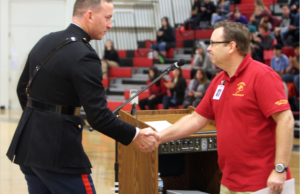 The purpose of Veteran’s Day, and the CFHS assembly, is to honor those who have given to the United States. Stewart also pointed out that Veteran’s Day is often confused with Memorial Day. “Memorial Day is about the death of veterans. Veteran’s Day recognizes the living ones, too,” Stewart said.